This exhibition and workshop series, funded by the Rockefeller Foundation’s New York City Cultural Innovation Fund, are part of a two-year, design-driven initiative aimed at helping neighborhoods and communities to support social innovations that create a more sustainable New York City. These activities range from healthy and local food initiatives, to environmental efforts, alternative modes of transportation, and sharing economies such as co-housing, food cooperatives, and bartering. “This project evolves from the basic principle that sustainable social innovations are present in hidden, less evident forms in cities around the world through the efforts of individuals or small, self-organized groups that seek to improve their lives and environments through collaboration,” said Eduardo Staszowski, director of the Parsons DESIS Lab. On November 12, the online micro-philanthropic initiative ioby will launch its “Recipes for Change” toolkit, which will enable community leaders to propose and implement sustainable initiatives in their neighborhood. RSVP: http://recipes4change.eventbrite.com/. On November 16, Green Map System, an organization that utilizes mapping to promote sustainable community development, will host a workshop for the North Brooklyn community. RSVP: web@greenmap.org. The exhibition will be on view through November 20 at Arts@Renaissance, 2 Kingsland Avenue at Maspeth Avenue in Brooklyn. 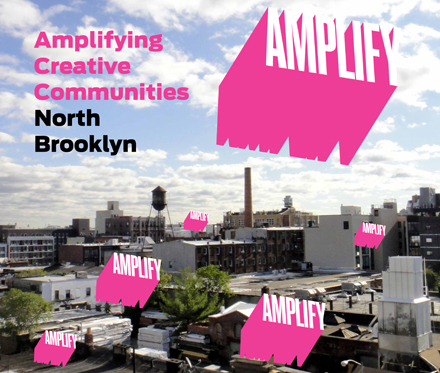 A free opening reception will take place November 10 from 6:00-9:00 p.m.
For more information, visit http://amplifyingcreativecommunities.net.